Among the eighteen major Puranas, the Narada Purana is perhaps the most significant, having been given by none other than the sage Narada. Narada Purana is what emerged from the lips of Maharshi Narada. Initially, it was a collection of about twenty-five thousand stanzas, but the currently available version of Narada Purana contains only twenty-two thousand stanzas. The content of Narada Purana has been divided into two parts. The first part contains four chapters, which include a dialogue between Suta and Shaunak on the origin of the universe, salvation, the birth of Sukadeva, training in the mantras, rituals of worship, provisions, and the results of the various fasts observed on particular days in particular months. The second part contains beautiful tales related to various incarnations of Lord Vishnu along with the significance of pilgrimage sites and performing pilgrimage. Narayanam namaskritya naranchaiva narottaman devim sarasvatinchaiva tato jayamudirayet. This is always the first shloka in any Purana. Narayana is another name for Vishnu. The couplet means that, prior to reading the sacred texts, one should pray to Narayana and Nara, the best of all humans. One should also pray to Sarasvati, the goddess of learning. It is only after these prayers are over that one can start reading the sacred texts known as jaya. The word jaya was initially used to refer to the Mahabharata, but subsequently came to include the Ramayana and the eighteen Puranas as well. a sacrifice, generally referring to the offering of sacrificial oblations of ghee into a sacred fire'); return false" style="color: rgb(0, 91, 128); text-decoration: none; border-bottom-width: 1px; border-bottom-style: dotted; border-bottom-color: initial; cursor: help; ">yajna), others meditated on the true nature of Vishnu, and still others made offerings to the great god. liberation from the cycle of birth and death'); return false" style="color: rgb(0, 91, 128); text-decoration: none; border-bottom-width: 1px; border-bottom-style: dotted; border-bottom-color: initial; cursor: help; ">moksha (liberation). They called for a huge assembly at which the means for attaining these goals might be debated. Twenty-six thousand rishis (sages) came to attend this assembly. As for their disciplines, there were too many to be counted. When the sages were busy discussing and debting, the sage Shounaka said, "I would like to submit something for the consideration of the assembly. Not very far from here is the hermitage (ashrama) known as siddhashrama. The sage Suta lives there. I do not need to remind you that Suta is Vedavyasa’s disciple and the great sage Lomaharshana’s son. Suta is learned in the Puranas. The best means for attaining the four goals is to listen to a recital of the sacred Puranas. Why don’t we go and ask Suta to recite the Puranas to us?" The other sages were delighted at this wonderful suggestion. They all trooped off to visit Suta in siddhashrama. Suta was engaged in performing a yajna then. That special yajna was known as agnishtoma and was dedicated to Vishnu. The sages waited till the ceremony was over. Then they told Suta, "We are your guests and it is your duty to serve your guests. You have to give us what we desire. We are thirsting for knowledge. Please recite to us the wisdom of the Puranas." "I will do that gladly," replied Suta. "Narada had recited to Sanatkumara the wondeful Narada Purana. A sinner who listens to a recital of this Purana is pardoned all his sins. This is the text that I am going to reveal to you. If one faithfully listens to the recital of even one couplet of this Purana, the severest of sins is forgiven. The only stipulation is that the text must never be revealed to those who are evil or to those who do not revere religion. Please focus your minds on Vishnu and concentrate. I am about to start." Brahma had four sons named Sanaka, Sanandana, Sanatkumar and Sanatana. All four of them became sages devoted to Vishnu. They were always on the search for wisdom and knowledge. Brahma had a city on the peak of Mount Sumeru. The four brothers once went on a visit to that city. By the side of the city flowed one of the tributaries of the holy river Ganga. This tributary was named Sita. The brothers were bathing in the river Sita, when who should arrive there but the sage Narada himself? Sanatkumara told Narada, "You are omniscient, you know everything. You are also a famous devotee of Vishnu. Tell us about the mysteries of Vishnu. Tell us about the methods whereby meditation becomes successful." Narada prayed to Vishnu and started the recital. Prior to creation, there was the great godhead (mahavishnu) which was everywhere. When the time for creation drew near, the godhead expanded himself into three forms. Brahma was created from the right side of the godhead and Brahma’s appointed task was creation. Shiva was created from the centre of the godhead and his job was destruction. Vishnu was created from the left side of the godhead. Vishnu was assigned the task of preservation. The female counterpart or principle of the godhead is referred to as Shakti. Shati divides herself into two, vidya (knowledge) and avidya (ignorance). Knowledge means an appreciation of the identity between the brahman and the universe. Ignorance is the absence of such an appreciation and it is ignorance that is responsible for the miseries of the world. Shakti herself is referred to by various names. When she is identified with Vishnu, she is known as Lakshmi; when associated with Shiva, she is called Uma or Parvati; and when in conjunction with Brahma, she is known as Sarasvati. But they are really one and the same, manifestations of the same force. Brahma and Sarasvati are thus together responsible for creation (srishti), Vishnu and Lakshmi are responsible for preservation (sthiti), and Shiva and Parvati are responsible for destruction (laya). The unified Shakti is sometimes also called Mahamaya or Prakriti. The universe is made of five elements (bhuta). Their names are kshiti (the earth) apa (the water). teja (the energy), marut (the wind) and vyoma (the sky). The universe is divided into fourteen regions (bhuvanas or lokas). Seven of them form the upper regions and are known as bhuloka, bhuvarloka, svarloka, maharloka, janaloka and satyaloka. There ae seven more regions that constiute the lower regions or the underworld. Their names are atala, vitala, sutala,talatala, mahatala, rasatla and patala. The word patala is also used to signify all of the underworld as a region. Each of the fourteen regions has its own inhabitants, mountains and rivers. The earth is bhuloka and the earth is split up into seven regions (dvipas). They are known as Jambudvipa, Plakshadvipa, Shalmaladvipa, Kushadvipa, Krounchadvipa, Shakadvipa and Pushkaradvipa. Bhuloka also has seven oceans named Lavana, Ikshu, Sura, Sarpih, Dadhi, Dughdha and Jala. Bharatavarsha lies in Jambudvipa. It is that part of the land which is bounded by the Lavana ocean on the south and the Himalaya mountains on the north. Bharatavarsha is a wonderful place to live in, and even the gods desire to be born in this land. Bharatavarsha is known as karmabhumi. Karma means action. This land is therefore a place where actions have to be performed. Bhoga means to enjoy or savour, Bhogabhumi is a place where the fruits of one’s actions are pleasured or savoured. Bharatavarsha is not a bhogabhumi, it is merely a karmabhumi. The fruits of actions performed in Bharatavarsha are savoured elsewhere. Good deeds are rewarded in heaven (svarloka or svarga) and sins have to be paid for in hell(naraka). To be born in Bharatavarsha means to be given the opportunity to perform good deeds. A person who does not avail of this opportunity is like a person who gives up a pot of amrita ( a heavenly life-giving drink) for a pot of poison. If one wishes to be rewarded in heaven, one should relentlessly pursue the path of good karma. But actions should not be performed with an eye to the fruits of such actions. One should disassociate oneself from the fruits, which vest only with Vishnu. This sort of detached action is known as niskama karma and it is superior to all other forms of action. But nothing can be accomplished without faith. Vishnu spurns prayers and offerings that are made by the faithless. Faith and devotion are like a mother. Just as a mother is the refuges of all living beings, faith and devotion are the refuges of those who are devoted to Vishnu. This is what Vishnu told Markandeya. Sanathkumara interrupted Narada. "Who was Markandeya?" he asked, "And what did Vishnu tell him?" Narada related the stories of Mrikandu and Markandeya. There was a sage named Mrikandu. A tirtha is a sacred place of pilgrimage and the place named shalagrama was the most wonderful of all tirthas. Mrikandu prayed for many years there. He regarded all other living beings as no different from his own self. Indra and the other gods got scared at Mrikandu’s tapasya. They themselves went and began to pray to Vishnu on the shores of the great ocean. "Lord," they prayed, "please deliver us from Mrikandu’s tapasya. He will please you with his meditation and heaven alone knows what boon he will then demand. He may dislodge us from heaven and start to oppress us." Vishnu was moved by the prayers of the gods and appeared before them. He held a conch-shell (shankha), a bladed-discus (chakra) and a mace (gada) in his hands. His eyes were like the petals of lotus flowers and his body shone with the radiance of a millions suns. His clothes wear yellow of hue and he was bedecked with jewellery. When the gods expressed their fears, Vishnu calmed them down. "Be at peace," he said. "I know Mrikandu. He is a righteous and good individual, I am sure that he has no intention of oppressing you. Only sinners peform meditation so as to obtain boons that can be used to oppress other people. I shall go to Mrikandu and find out what he wants." Having blessed the gods, Vishnu went to pay Mrikandu a visit. The sage was delighted to see Vishnu. He fell at Vishnu’s feet and did obeisance. "I am pleased at your tapasya," Vishnu told Mrikandu. "Crave the boon that you desire." "I want no boon," replied Mrikandu. "You have appeared before me, you whom the gods themselves find it difficult to see. What more can I want? I have no more desires." "That cannot be," retorted Vishnu. "Let it not be said that Vishnu appeared before a devotee and did not grant hima boon. I’ll tell you what we can do. I will myself be born as your son. Any line in which I am born is forever blessed. And that is what is going to happen to your line as well." Vishnu then blessed Mrikandu and departed. Mrikandu had a son named Markandeya. Since Markandeya was born form Vishnu, he shone with radiance and was also a very holy man. He became well-versed in the knowledge of all the shastras (sacred texts). Markandeya started to pray to Vishnu. Vishnu was so pleased withhim that Markandeya was granted the boon that he would compose a Purana. This was the Markandeya Purana. The entire world is periodically destroyed and flooded with water. At the time of one such destruction, all living beings on eath were killed. But Markandeya was spared by Vishnu. He floated on the water like a dried leaf. This went on for a long, long time. To understand how long this was, one has to have some conception of the measurement of time. The small unit of time is a nimesha, fifteen nimeshas constitute one kashtha, thirty kashthas make a kala and thirty kalas are one kshana. There are six kshanas in one danda, two dandas in one muhurta and thirty muhurtas in one day. There are thrity days in a month and each month is divided into two pakshas of fifteen days each. Two months constitute a season (ritu) and three ritus constitute an ayana. There are thus six seasons and two ayanas in a year. The two ayanas are known as uttarayana and dakshinayana. One year for humans is equivalent to one day for the gods. Uttarayana corresponds to day for the gods and dashinayana to night. Twelve thousand years of the gods are known as a mahayauga. Each mahayuga is divided into four sub-periods of satya yuga, treta yuga, dvapara yuga and kali yuga. Two thousand mahayugas are merely one day for Brahma. There are fourteen eras (manvantara) in each of Brahma’s days. Brahma’s nights are just as long and it is during Brahma’s night that the world is destroyed and flooded with water. Each of Brahma’s days is called a kalpa. A hundred years for Brahma are equivalent to a single day for Vishnu. This gives you some idea of how long Markandeya floated on the water, throughout one of Brahma’s nights. The sight of the water everywhere frightened Markandeya out of his wits. But he continued to pray to Vishnu. And thanks to Vishnu’s blessing, no harm came Markandeya’s way. Vishnu even appeared before the sage and said, "I shall save you. I always protect those who pray to me devoutly. Let me also tell you the signs of my true devotees. They love all other living beigns and are free of jealousy and hatred. They never cause pain to others through their thoughts, words or deeds. They are peace-loving. My devotees serve sages, guests, and parents well. They build temples and dig wells and ponds. They read and interpret the Puranas. In fact, you display all the traits of a true devotee of Vishnu’s." Blessed by Vishnu, Markandeya performed a lot of tapasya in the tirtha known as shalagrama. Some other Puranas state that Markandeya became immortal due to a boon received from Vishnu. The Padma Purana however states that this boon was received from Brahma. The Markandeya Purana gives many more details about Markandeya. The most holy of tirthas is the confluence of the rivers Ganga and Yamuna. Someone who bathes there attains perpetual good health, prospers, lives to a ripe old age and is pardoned all his sins. Even the gods and the sages are fond of the waters at this sacred confluence. The river Ganga emerges from the feet of Lord Vishnu himself. (The story of this is related in the Brahmanvaivarta Purana.) And the river Yamuna is the daughter of the sun god Surya. (This is related in many Puranas, such as the Markandeya Purana. Yamuna was the daughter of Surya and Samjna.) Such being the origins of these two holy rivers, it is but natural that their confluence should be so sacred. In fact, the Ganga is so sacred that even if one just thinks of her, all pain is relieved and all sins are pardoned. Along the banks of the Ganga is a remarkable tirtha known as Prayaga. Brahma himself peformed a yajna there. You can bathe in the waters of all the tirthas if you so desire. But the punya (store of merit) that you will acquire from this is only a sixteenth of the punya you will acquire from touching a few drops of water from the Ganga. A person who anoints his head with mud taken from the banks of the Ganga becomes like Shiva himself. There are three objects that are sacred to Vishnu - the Ganga, the tulasi (basil) bush and dust from the feet of a devotee of Vishnu. There are some other rivers also in which the Ganga is always present. Their names are Godavari, Sarasvati, Kalindi, Kaveri, Krishna, Reva, Vahuda, Tungabhadra, Bhimarathi, Vetravati, Tamraparni and Shatadru. In the solar dynasty there was a king named Vrika. Vrika’s son was Vahu and Vahu became king after his father’s death. One of the four natural divisions of society, which refers to the spiritualists. In later times it came to refer to a caste determined by birth. '); return false" style="color: rgb(0, 91, 128); text-decoration: none; border-bottom-width: 1px; border-bottom-style: dotted; border-bottom-color: initial; cursor: help; ">brahmanas, kshatriyas, vaishyas and shudras. It is desirable that each of the classes should follow the duties that are prescribed for it, otherwise there is complete chaos. What are the duties prescribed for each of the four classes? The Narada Purana will detail them subsequently. To come back to the point, Vahu ruled so well that during his reign, none of the classes deviated from its pre-assigned duties. As you have been told earlier, the earth is divided into seven regions or dvipas. In each of these dvipas, King Vahu performed an ashvamedha yajna (horse sacrifice). The king was not only wise, he also defeated all his enemies. His subjects were happy, rains came on time and there were good harvests. The sages performed their meditations free of all fear, and sin virtually vanished from earth. For ninety thousand years the king ruled happily. But thereafter, trouble started. All this pomp and glory turned Vahu’s head and he began to think,"I rule over everyone. I am all powerful and I have performed many yajnas. Why should anyone else but me be worshipped? Do I not rule over the ends of the earth? Am I not learned in the shastras? I do not think that here is anyone superior to me." This inflated ego was a calamity and brought other evil traits. The possession of four objects lead to unhappiness. These four objects are youth, wealth, power over others and lack of foresight,. Unfortunately, all four were combined in King Vahu. He started to suffer from envy and jealousy and soon made enemies. It does not take very long for an envious person to make enemies. Among the power enemies that King Vahu had to contend with, were kings known as Haihayas and the Talajanghas. And since the king had been dislodged from the righteous path, Vishnu and Lakshmi (the goddess of weath and prosperity) also deserted him. After a fierce battle that went on for a month, the Haihayas and the Talajanghas managed to defeat the king. They annexed his kingdom and drove him off into the forest. Vahu’s wife Yadavi was expecting then. Vahu’s enemies were not content with driving him off into the forest. They feared that Vahu’s son might try to avenge his father. They therefore fed Yadavi some poison (gara). (This does not agree with the account given in some other Puranas, such as the Padma Purana. In those accounts, Vahu had a second wife. And it was this second wife who fed Yadavi poison). Vahu was now penitent for his past misdeeds. With his wife, he intended to seek peace and solitude in the sage Ourva’s ashrama (hermitage). But the way to the hermitage was long and the king suffered from hunger and thirst. He dIscovered a pond on the way and thought that he might drink some water from the pond. Vahu and Yadavi quenched their thirst and rested under the shade of a tree that grew by the side of the pond. On that tree lived many birds. They began to talk amongst themselves. "Hide," they said. "The sinner Vahu has come here. It is best not to look upon him." King Vahu overheard this conversation and was mortified. He discovered that people were also freely criticising him. Even his subjects were not at all unhappy that he had been robbed of his kingdom. This made the king so miserable that he had no further desire to live. His health deteriorated and old age took its toll. Vahu died as soon as he reached Ourva’s ashrama. His wife wished to immolate herself on her husband’s funeral pyre. But the sage Ourva restrained her. "You are expecting and such an act would be tantamount to murder," He said. "It is a crime that I cannot permit to happen. Please refrain from what you are about to do. I can foretell that you will give birth to a powerful king." Yadavi listened to the sage’s advice. She performed Vahu’s funeral rites and accompanies Ourva to his hermitage. Yadavi lived in the hermitage and, in due course, gave birth to a son. You will recall that she had been fed some poison. The poison had done her or the baby no harm and was ejected when Yadavi gave birth. Since the word gara means poison and since sa means together with, the baby was given the name of Sagara. Ourva took great interest in the boy’s development. He taught Sagara the shastras and the duties of a king. When the boy grew up, the sage also taught him the art of warfare. Sagara became leanred, honest and wise, apart from being brave and powerful. One day Sagara asked his mother, "Where is my father? Who is he and where is he now? Cursed is the person who does not have a father. Please tell me where my father is." Yadavi had not so far told her son anything about King Vahu. But now she had no choice. When Sagara got to know how his father’s enemies had driven his parents out from their kingdom, he resolved to exact vengeance. He sought his mother’s blessings and bade farewell to Ourva. King Vahu had had the sage Vashishtha as chief priest and guru (teacher). Thus, Vashishtha should be Sagara’s priest and teacher as well. Sagara went to visit Vashistha and received the sage’s blessings. The sage also gave him several divine weapons named aindrastra, varunastra, brahmastra and agneyastra, and a wonderful bow as well. This made Sagara invincible. Thus fortified, Sagara waged war on his father’s enemies and defeated them. Some of them were killed outright. Others fled to Vashishtha for refuge and Sagara followed them there. "Sage," he said, "it is better to kill these sinners. Please do not grant them refuge. Only the stupid permit evil enemies to live." "No," answered the sage. "Let them be. There is no point in senseless killing. These sinners will have to pay for their misdeeds later. Why should you commit a sin by killing them when they have sought refuge?" Sagara spared the enemies. But he did mete out token punishments to the enemies. Amongst his foes were the Shakas and their heads were shaved off. Also amongst the foes were the Yavanas and these were instructed that , henceforth, they would have to sport long hair. As for the other enemies , their heads and beards were shaved off and they were told that would no longer be permitted to follow the sacred religion laid down in the Vedas. Sagara was then crowned king by Vashishtha. He had two wives. The first was Keshini, the daughter of the king of Vidarbha. The second wife was named Sumati. The sage Ourva had got to know about Sagara’s coronation and marriage. He came to bless him. "I shall grant your wives a boon," he said. "One of your wives will have a single son and the other will have sixty thousand. Tell me who wants what." Keshini wanted a single son and Sumati desired sixty thousand. Having granted the boon, Ourva returned to his hermitage. There is some inconsistency here with the account given in the Mahabarata. In the Mahabarata, Sagara did not have any sons and prayed to Shiva so that he might have offspring. The boon was granted by Shiva nd not by Ourva. And it was Sumati who had the single son and Keshini, sixty thousand. To return to the account of the Narada Purana, Keshini had a son. Right from birth, this son turned out to be evil. The word asamanjasa means unbalanced or improper. Since the son was evil, he came to be known as Asamanjasa. Meanwhile, Sumati gave birth to sixty thousand sons and, following their elder brother’s lead, these sons too became evil. At first, Sagara ignored the misdeeds of his sons. He tended to dismiss them as juvenile exuberance. In any case, Asamanjasa had a son named Amshumana who turned out to be quite unlike his father and uncles. Amshumana was good and righteous. But Asamanjasa and his brothers continued to do as they pleased. They disrupted the performances of yajnas and oppressed religious people. They appropriated for themselves the offerings that were made to gods at sacrifices. Apsaras (dancers of heaven) were abducted by these evil princes. They also stole flower from the divine parijata tree. Drinking was their favourite pastime, together with robbery and theft. They even wagen war against his father Sagara himself. Need one say more? Indra and the other gods began to plot so as to devise ways for bringing about the destruction of Asamanjasa and his brothers. There was a sage named Kapila who was devoted to Vishnu. He was so powerful that he was like the great Vishnu himself. Kapila had an ashrama in the underworld. The gods went there and started to pray to Kapila. "Great sage," they said, "Deliver the world from the depredations of Sagara’s evil sons." "Do not despair," answered Kapila. "Those who oppress others are sinners and fate decrees that they are soon destroyed. Thee princes will soon have to pay for their misdeeds. Go back to heaven and rest in peace." The gods returned to heaven. Meanwhile, King Sagara organized an ashvamedha yajna. Vashishtha and other great sages satced as priests at this sacrifice. In such a sacrifice, a horse is an important part of the ceremony and is left free to wander around wherever it chooses. Indra chose an opportune moment to steal the horse. He then left the stolen horse in Kapila’s hermitage in the underworld. Sagara’s sons were supposed to guard the horse. When the horse was found to be missing, they looked everywhere for it. But in vain. The horse was not to be found in any of the seven regions (lokas) that form the upper reaches of the universe. The princes therefore concluded that the horse must be hidden somewhere in the underworld. They went to the shores of the ocean. And there, each of them began to dig a hole in the ground so that they might be able to penetrate to the underworld. Thus it was that all sixty thousand sons along with Asamsanjas entered the underworld. And in these lower regions they happened to come upon the sage Kapila’s hermitage. The stolen horse was tethered in the hermitage. Oblivious of everthing, Kapila was busy meditating. The princes concluded that it was the sage who had stolen the horse. They proceeded to tie up Kapila. "Tie up the thief," they exclaimed. "Bind him and kill him. Look at the way the thief is him and kill. Look at the way the thief is meditating. This is one of the laws of the world. He who is the greatest sinner, pretends to be the most holy." Sagara’s sons bound up the sage, although this did not disturb Kapila’s meditation. But thereafter,the princes began to kick Kapila and tug at this arms. This roused the sage from his meditation. Angered at the disturbance, he sternly gazed at the princes. Such was the fury of Kapila’s gaze that the princes were immediately burnt to ashes. So terrible were the flames that emanated from Kapila’s eyes that the snakes, who lived in the underworld, fled from there and sought refuge in the waters of ocean. The saga Narada brought the news of this misfortune to King Sagara. But the king did not mourn the death of his sons. He was rather pleased that his evil sons had been so destroyed. But the horse had to be brought back so that the sacrifice might be completed. There was also a stipulation that he who had no son did not have the right to perform a yajna. Sagara therefore adopted Amshumana as his own son. He also instructed Amshumana to go and fetch the horse. Amshumana went down to the underworld to Kapila’s hermitage. He prayed to the sage. "Please forgive my uncles and my father," he said. "The holy are by nature forgiving. They are like sandalwood. Just as sandalwood continues to give off fragrance even if it is chopped, the holy forgive those who do them harm. Please pardon the sin." "I am pleased with you," said the sage. "Ask for a boon." "Please tell me of a way whereby my father and uncles may ascend to heaven," requested Amshumana. "There is nothing else that I desire." "Your grandson will bring down the holy Ganga from heaven," answered Kapila. "When that happens, your father and uncles will be pardoned their sins and will ascend to heaven. Take the sacrificial horse now and go. My blessings are with you." Amshumana returned to Sagara and related all that had happend. Amshumana had a son named Dilipa and Dilipa’s son was Bhagiratha. It was Bhagiratha who brought down the river Ganga from heaven. One of Bhagiratha’s descendants was a king named Sudasa. Sudasa’s son was Mitrasaha, also known as Soudasa. Vashishtha cursed Soudasa that he would become a rakshasa (demon). But as soon as Soudasa touched the holy water of the Ganga, he returned to his human form. The sages interrupted Suta. "You are going too fast," they complained. "Why was this Soudasa and why was he cursed by the sage Vashishtha? How can you proceed without telling us the whole story?" Soudasa was a king. And as a king he was good and righteous. He was learned in the shastras. Blessed with good fortune, he had many sons and grandsons and was exceedingly wealthy. He ruled happily for thirty thousand years. Once King Soudasa went to the forest for a hunt. With him were his soldiers and ministers. But while pursuing a black buck, Soudasa got separated from his companions. His pursuit led him to a place in the forest where he found two tigers sporting. With an arrow, the king killed one of the tigers. Before dying, the tiger adopted the form of a gigantic rakshasa. "I shall have my revenge," said the other riger and vanished. Soudasa was mystified at these happenings. He was also slightly scared. When he was reunited with his companions, he related to them all that had transpired. With slight misgivings,the retinue returned tot he capital. After some days had passed, the king decided to organize a horse sacrifice. Vashishtha and other sages were invited to act as chief priests. After the yajna was over, Vashishtha went off to have a bath. Meanwhile, the rakshasa who had been in the form of tiger appeared before Soudasa. But he was now in the disguise of Vashishtha and the king did not see through the deception. "King," said the rakshasa, "get some meat cooked for my meal. I am going to have my bath>"
Soudasa instructed his cook to do the needful. The rakshasa now adopted the form of Soudasa’s cook and brought the king some cooked human meat. Soudasa did not realize this and he waited patiently for the sage to return. When the real Vashishtha came back after completing his bath, Soudasa served him the human meat. Vashishtha of course recognized the meat to be human meat and was furious. "Audacious king," he exclaimed, "how dare you serve me human meat? That is the food of rakshasa. For this sin, I curse you that you will become a rakshasa and will live on human meat." The king did not understand what was going on. But through his powers, Vashishtha got to know that the entire affair what been no fault of the king’s. He had been deceived by a demon. When Soudasa realized this, his anger was aroused. He felt that his guru (teacher) Vashishtha had unjustly cursed him. Soudasa therefore prepared to curse the sage. But the king’s wife Madayanti intervened. "Have you taken leave of your senses?" She asked. "How can you curse your own guru?" Control yur anger. What was destined to happen to you has happened. How can you blame Vashishtha for that?" Madayantis words curbed Soudasa’s anger. But the act of cursing required some water to be taken up in one’s hands. Mantras (incantations) were then to be chanted over this water. What was going to happen to the water over which Soudasa had chanted incantations? It had become sanctified and was energized. Soudasa flung the water onto his own feet. The holy water immediately blackened the king’s feet. Since the word kalmasha means black and pada means feet, Soudasa henceforth came to be known as Kalmashapada. The king touched Vahishtha’s feet and begged forgiveness. "Please pardon me, " he begged. Vashishtha was now dismayed at his own anger. He realized that he had been hasty and had punished the king for no fault of his own. "A curse once imposed cannot be revoked," he told Soudasa. "But you will not remain as a rakshasa indefintely. The duration of the curse will be for a period of twelve years. After this period is over, the holy water of the river Ganga will purify you and you will return to your human form." The unhappy king retired to the forest as a rakshasa. He lived on deer, lizards, birds and humans. When all the living beings in the forest had been eaten, he moved on to another forest. Thus it continued and Soudasa the rakshasa moved from forest to forest. Eventually the demon arrived on the banks of the river Narmada. A sage and his wife lived on the banks of river. Soudasa grabbed the sage and prepared to devour him. The sage’s wife begged the demon to spare her husband. "You are not really a raksahas, " she told the king. "You were born a kshatriya (the second of the four classes) and used to be a king. Please remember that you belong to the great solar dynasty, that you are the king Mitrasaha or Soudasa. Please recollect the way of dharma. I am like a daughter unto you. Protect me and spare my husband. Soudasa paid no heed to these words. He ate up the sage. The sage’s wife thereupon cursed Soudasa. "You did not listen to my entreaties," she said. "Therefore, I curse you. You will die when you meet your wife. Moreover, you will continue to be a rakshasa for a long time." "I have committed only one sin," replied Soudasa, "yet you have cursed me twice. You have cursed me that I will die when I meet my wife, that is curse number one. You have also cursed me that I will be a rakshasa for a very long time, that is curse number two. My single sin had been that of eating your husband. Two curses for one sin is most improper. I accordingly curse you. You will become a pishacha (demon)." Now there were two demons who were wandering around, Soudasa and the sage’s wife. These two demons came to the banks of the river Narmada. In a banyan tree that stood near the river, there lived a third rakshasa (demon). "Who are you two?" asked the demon. Soudasa and the sage’s wife told him their stories. "And who are you?" Soudasa then asked the demon. The demon related his story. He used to be a brahmana (the first of the four classes) named Somadatta lived in the Kingdom of Magadha. He was extemely religious and devoted to the Vedas. But unfortunately, he happened to insult his guru and was cursed that he would become a rakshasa. Having exchanged notes on their past lives, the three demons continued to live there. One day, a brahmana from the land of Kalinga happened to arrive at that place. The brahmana’s name was Garga. The three demons saw Garga coming and were delighted. "Food has come, food has come," they exclaimed. But Garga was busy chanting the names of Shiva and Vishnu, and the demons could not even approach the brahmana. They then addressed Garga and said, "You must be a very holy man. We have eaten several brahmans, but you are the first one whom we could not even approach. You alone can deliver us. Please sprinkle some water from the holy river Ganga on our bodies." Garga was slightly surprised at hearing three demons praise the river Ganga, but he did as he had been bidden. He took up some of the holy water in a tulasi(basil leaf) and sprinkled it on the bodies of the demons. Immediately, the demons attained divine forms. The sage’s wife and Somadatta both ascended to heaven. As for Soudasa, he first went on a pilgrimage to the city of Varanasi. Thereafter, he returned to his own kingdom and ruled there happily. Need one say more about the wonderful properties of the holy river Ganga? There was a brahmana named Kashyapa who was the father of Indra and other gods. Kashyapa married two of Daksha’s daughters. They were named Diti and Aditi. The gods (suras or adityas) were Aditi’s sons and the demons (asuras or daityas) were Diti’s sons. The gods and the demons did not like each other and perpetually fought amongs themselves. The demons had an extremely powerful king named Vali. He was Virochana’s son and the grandson of Prahlada. Vali was so strong that he conquered the entire world and thereafter resolved to conquer and annex heaven. So prosperous was Vali that his riches are impossible to describe. He possessed millions of elephants, horses and chariots, and a huge army. His two chief ministers were named Kumbahanda and Kupakarna. Vali also had one hundred sons who were the equals of their father in valour and wisdom. The eldest son was named Vana. So the terror that Vali’s invasion of heaven caused can easily be imagined. Threatened with a siege, the gods came out to fight. Terrible was the war that raged. Countless arrows darkened the sky. The wheels of chariots thundered, horses neighed, elephants trumpeted, and the sound of the twangs of bows filled the battlefield. All other living beings feared that the universe was about to be destroyed. The demons hurled mountains at Indra and the king of the gods chopped these up with his arrows. Elephants fought with elephants, horses with horses and chariots with chariots. Blood flowed freely and dead bodies littered the battlefield. For a thousand years the fighting went on. But eventually, the demons defeated the gods. The gods were forced to flee from heaven and started to dwell on earth in human disguises. Vali was not an evil person. He was indeed quite devoted to Vishnu. He performed yajanas and ruled over the three regions of heaven, the earth and the underworld. He ruled rather well. But Aditi was greatly distressed to see her sons suffer thus. She desired that the demons might be vanquished and that Indra might be restored to heaven. She therefore retired to the Himalayas and there began to pray to Vishnu. She meditated sitting and she meditated standing. For part of her tapasya she stood on one leg, for some more time she stood balanced on her toes. For some time she ate only fruit, then only leaves and later still, she thrived only on water. Eventually, Aditi gave up both food and water. For a thousand years she prayed to Vishnu in this fashion. Vali got to know about Aditi’s meditation and sent his companions to distract her. These demons appeared before Aditi in the guise of gods and said, "Mother, please give up this difficult meditation. Your body is suffering. You are trying to do all this for us. But do you think that we will survive if our mother dies? Please desist." But Aditi did not listen to these entreaties. She continued to pray and this angered the demons. From this anger emerged fire and the flames threatened to engulf Aditi. But such was the power of Aditi’s tapasya that the fire could do her no harm. Instead, the flames burnt down the entire forest and all the demons who had gathered there to disturb Aditi. At long last, Vishnu appeared before Aditi. "I am pleased at your tapasya," he said. "What is the boon that you desire?" "You are the lord of everything," answered Aditi. "Please deliver my sons from the demons." "It shall be as you desire," said Vishnu. "I will be born as your son. And in that form I will bring deliverance for your sons." After some days, Aditi gave birth to a boy who was known as vamana (a dwarf). Meanwhile, Vali had begun a yajana and the chief priest at this sacrificial ceremony was Vali’s guru Shukracharya. Several sages came to attend this ceremony and so did the dwarf. Shukracharya realized that the dwarf was none other than Vishnu and tried to warn Vali. "Be careful," he said. "This vamana is Vishnu. Don’t grant him a boon or promise him anything. I am sure that he has come here to deceive you." "That is impossible," responded Vali. "It is my good fortune that Vishnu has come here to grace my house. How can I refuse him what he wants?" He then went up to the dwarf and said, " I am blessed that you have come. Please tell me how I can serve you." "I need some land for my prayers," answered the dwarf. " Please grant me as much land as may be covered in three of my footsteps." This boon Vali granted. But as soon as the boon had been granted, the vamana started to increase in size. Vishnu placed his first step on heaven and the second on the earth. Since there was no more space left, the third step was placed on Brahma’s world of Brahmaloka. But in the process, the universe was split asunder and a lot of water emerged from the centre of the universe (brahmanda). These waters washed Vishnu’s feet and poured down on Mount Sumeru. Thus they formed the holy river Ganga. What was to be done about Vali? There was no place left for him to live in. Pleased at Vali’s generosity, Vishnu granted him the boon that he could live in the underworld with the other demons. In Sagara’s line, there was born a king named Bhagiratha. He was a truthful and righteous king. He regularly performed sacrifices. He was also handsome, brave and wise. The god Yama himself came to see what sort of a person Bhagiratha was. The king worshipped Yama with offerings and said, "I am blessed that a great god like you has come to visit a mere mortal like me. Please tell me about dharma (righteousness). What are the characteristics of those who are righteous? Tell me about sins. What happens to those who are sinners? Yama told Bhagiratha about the deeds that bring punya (store of merit). The greatest punya is acquired from donating wealth to brahmanas. Or from providing them with employment. Another performer of good deeds is one who gets a pond digged. Punya is also acquired by building temples dedicated to Shiva or Vishnu. The best temple is one that is made of gold. Progressively lower down the ranking are the ones that are made of copper, crystal, stone, bricks and wood. He who maintains a pond, a temple or a village is also a performer of good deeds. Donating alms like cattle or land also brings punya. Other good deeds are establishing gardens and planting trees. Any one who plants a basil bush is eternally blessed. Sins are pardoned if one wears a garland of basil leaves around one’s neck. These who bathe Vishnu’s images with milk or clarified butter are certain to be taken to heaven. The images can also be bathed with coconut-milk or sugar-cane juice . Shiva’s images should also be thus bathed. A tithi is a lunar day. The lunar fortnight during which the moon waxes is known as shuklapaksha and the lunar fortnight during which the moon wanes is known a krishnapaksha. Certain specific tithis are particularly auspicious for bathing imates of Vishnu and Shiva. Examples are panchami (the fifth day of the lunar fortnight), ashtami (the eight day), ekadashi (the eleventh day), dvadashi (the twelfth day) and chaturdashi (the fourteenth day) in shuklapaksha. Purnima (the day of the full moon) and solar and lunar eclipses are also auspicious occasions. Punya can be acquired through donating food to the hungry and water to the thirst. A person who donates these objects never has to go to hell (naraka). Another good deed is to massage the feet of guests with oil. Anyone who helps brahmanas or donates cows to them is blessed. One who protects those who seek refuge also obtains a lot of punya. The importance of donating alms cannot be over-emphasised. Apart from cows, buffaloes can also be donated. Other objects which may be donated are curds, milk, clarifed butter, honey, sugar-cane, fragrant objects, flowers, fruit and molasses. Knowledge (vidya) is also a worthwhile object for donation. Gold, jewellery and precious stones too qualify for donations. Images of Shiva (linga) and Vishnu (shalagrama) should also be donated. Other traits characterise those who have acquired punya. They do not criticise others and prefer to associate with people who are righteous. They have managed to control their senses and are not too addicted to food. They serve guests, brahmanas and teachers well. Vishnu and the other gods are forever in their minds. Yama next told Bhagiratha about sins, and the various hells (naraka) where sinners have to suffer. Hells are terrible places and there are several such narakas. The names of some such hells are Tapana, Valukakumbha, Rourava, Maharourava, Kum-bhipaka, Nirucchvasa, Kalasutra, Pramar-dana, Bhishana, Asipatravana, Lalabhakshya, Himothkata, Mrishavastha, Vasakupa, Shvabha-kshya, Mutrapana, Purishahrada, Taptashula, Taptashila, Shalmali-druma, Shonitakupa and Shonitabhojana. In some of these hells sinners are made to eat their own flesh. In others, they are burnt in fire. Some hells are such that stones and weapons are showered down on the sinners. Narakas may be extemely hot or extemely cold. Sinners are fed molten iron. They are hung upside down. In some hells, sinners are hurled down from mountain-tops. Worms feed on sinners and they are compelled to lie down on burning coals. Throughout, Yama’s servants beat the sinners with clubs. Their bodies are sliced with swords and bitten by snakes. Scorpions are also let loose on the sinners. Jackals and tigers feed on their meat. There are so many different types of misery in the hells that it would take a thousand years to catalogue all of them. Sinners are those who kill brahmanas, drink wine or steal gold. It is sinful to criticise brahmanas or elders. One who promises to donate alms but goes back on his word, also commits a crime. An egotist is a sinner. It is forbidden to dabble in medicine or astrology without knowning the shastras. One who interprets the shastras without knowing them is a sinner. Slander, vanity, lying, fraudulence and murder are crimes. One who partakes of food offered by a shudra (the fourth of the four classes) is a sinner. Thieves are bound to be punished. One who associates with a sinner becomes a sinner by contamination. Sins can be atoned for by performing penance (prayashchitta). But there are some sins for which there is no penance. Such a sin is the worshipping of an image of Shiva or Vishnu that has been worshipped by a shudra or by a woman. Shudras and women are not supposed to touch images of Shiva and Vishnu. One who murders a brahmana may perform prayashchitta for his sin. But there is no penance for someone who hates brahmanas. This is also true of someone who criticises his teacher or the sacred Vedas. A brahmana who strays into the fold of Buddhism cannot hope for deliverance through penance. After sinners have paid for their sins in hell, they are born again. One who commits a severe sin is first born as a tree. In successive births, he is then born as a worm, a snake, an animal and as someone who does not believe in the Vedas. Eventually, he is born as a poor brahmana. Other sinners spend seven lives as donkeys, ten lives as dogs and pigs, a hundred years as worms, a hundred years as rats, and twelve lives a snakes. A thousand lives thereafter are spent as animals like deer, before the sinners are finally born as cows. Seven lives then have to be spent as chandalas (outcasts), sixteen lives as shudras, two lives as kshatriyas and two lives as vaishyas (the third of the four classes). Next, sinners are born as brahmanas, but only as poor and diseased brahmanas. Vishnu delivers humans from all evil. The fruits of all actions should be vested with Vishnu. Devotion to Vishnu is of paramount importance, but there are different types of devotion to Vishnu. The three basic elements (guna) are sattvika, rajasika and tamasika. Sattvika guna is holy and pure, rajasika guna is passionate and tamasika guna is torpid. Thus sattvika guna is superior rajasika guna is medium and tamasika guna is inferior. The third stage of sound, sometime referred to as mental sound. Also can mean middle grade when used generally. '); return false" style="color: rgb(0, 91, 128); text-decoration: none; border-bottom-width: 1px; border-bottom-style: dotted; border-bottom-color: initial; cursor: help; ">madhyama-tamasa. A person who picks up devotion to Vishnu by observing others praying is uttma-tamasa. An adama-rajasa devotee claims wealth from Vishnu as a reward for his devotion, a madhyama-rajasa devotee claims the fame of great deeds and an uttama-rajasa devotee desires freedom from all illusions. A devotee who prays so as to atone for his sins is adhama-sattvika. One who prays because such prayers are loved by Vishnu is madhyama-sattvika. And a devotee who prays for the sake of devotion alone is uttama-sattvika. This list thus has nine different types of devotion to Vishnu. But there is one further type of devotion to Vishnu, and this is the best form of devotion that one can think of. This is known as uttamottama devotion and occurs when the devotee feels no difference between himself and Vishnu. There is complete union and identification. Concluding the account, Yama told Bhagiratha, "King, I have answered all your questions. Be righteous and prosperous. Rule well and be devoted to Vishnu. But do not forget that there is no difference between Vishnu and Shiva, they are one and the same. Your ancestors were evil and are now rotting in hell. They will be freed when the waters of the river Ganga touch their ashes. I bless you. Do now as you will." Yama departed. Bhagiratha resolved that he would perform tapasya so as to bring down the Ganga from heaven. He accordingly went off to the Himalayas to meditate. (The Narada Purana gets slightly confused here. Having stated that Bhagiratha went to the Himalayas to meditate, it states that the king went to the banks of the river Godavari. The accounts in the Ramayana and the Matysa Purana are unambiguous in stating that Bhagiratha went to the Himalayas). To return to the account of the Narada Purana, Bhagiratha went to the banks of the river Godavari, where the sage Bhrigu had a beautfiul hermitage. In the nearby forest lived black buck, elephants and boars. Birds chirped on the trees, peacocks danced in gay abandon. The forest was full of trees and flowers. Bhagiratha worshipped Bhrigu and said, "Great sage, you are well-versed in the ways of dharma and learned in the shastras. Please tell me how I may please the Lord Vishnu." "King," replied Bhrigu, "you are indeed holy . Had that not been the case, you would not have thought of trying to free your ancestors. Be truthful, do not lie, and always associate with those who are good. Give up all thought of violence. And most important of all, always meditate on Vishnu. That will bring you punya." "What is truth?" asked Bhagiratha. "What is non-violence? Who are the people who are good? What is punya? How does one go about worshipping Vishnu? Great sage, you are well-versed in the knowledge of all the shastras. Treat me like a son and tell me the answers to all these questions. Bhrigu obliged. He told Bhagiratha that truth consisted of saying that which was in consonance with the dictates of religon and did not contradict it. Non-violent acts were those that did not cause other living beings any harm. The evil were those who treated other people as enemies were against religon and were also stupid. Those who were not evil were good. They did that which was right, followed the Vedas and performed acts that were beneficial to other living beings. All that good people did constituted punya. There were no prescribed rites for worshipping Vishnu. The best form of worship was to realize that Vishnu was everywhere in the universe, that he was the cause of everything, and that every living being was completely identified with Vishnu. Armed with this wisdom, Bhagiratha bade adieu to Bhrigu and went to the forest to meditate. After spending some time in the forest, he went to the Himalayas. The river Ganga flowed there, at a tirtha (place of pilgrimage) named Nadeshvara. It was there that Bhagiratha decided to meditate. The tapasya that he performed was extemely difficult. He lived on fruits and roots and made offerings of leaves, flowers, fruit and water to Vishnu. Several years passed. Bhagiratha next began to control his breath though the technqiue of pranayama. For sixty thousand years Bhagiratha prayed in this way. So difficult was the meditation that smoke started to billow out of Bhagiratha’s nostrils. The gods got frightened at these happenings. They were worried that Bhagiratha might obtain a boon as a reward for his tapasya and try to dislodge them from heaven. The gods therefore went to the northern shores of the ocean known as Kshiroda and began to pray to Vishnu. Vishnu appeared before them and assured them that Bhagiratha had no such evil intentions. In any case, he would go and find out what it was that Bhagiratha wanted. Vishnu accordingly appeared before Bhagiratha and the king fell down at Vishnu’s feet in obeisance. "Bhagiratha," said Vishnu, "I know that you want to free your ancestors. Shiva is no different from me, we are really one and the same. Please pray to Shiva. He will do what you desire." After Vishnu had left, Bhagiratha started praying to Shiva. Shiva appeared before the king. He had five heads and ten arms, and he wore the crescent moon on his forehead. Snakes hung like garlands around his neck and he wore the skin of an elephant as clothing. "Bhagiratha," said Shiva, "I am pleased with your meditation. Crave a boon. I grant you the boon that you will prosperous and will attain eternal bliss." "Lord," replied Bhagiratha. "If you are indeed pleased with me, grant me the boon that the heavenly river Ganga might be brought down from heaven. I wish to free amy ancestors." Bhagiratha started to return and the river Ganga followed the king wherever he went. It is for this reason that the river is also known as the Bhagirathi. Bhagiratha held the river to the place where Kapila’s hermitage was, that is the place where his ancestors had been burnt to ashes. As soon as the water from the holy river touched those ashes. Sagara’s sons were freed from hell and ascended to heaven. A vrata is a religious rite performed on a special occasion. The Narada Purana next describes several such important vratas. One such rite is known as ekadasi vrata, so called because it is performed ekadashi tithi (the eleventh day of the lunar fortnight). The rite is observed in the month of Agrahayana, during shuklapaksha. One has to stay up during the night and bathe a shalagrama image in the morning with milk. Sesamum seeds are to be offered to a fire and offerings of good are made to Vishnu and Lakshmi. Brahmanas have to be invited and fed and they are also given alms. Similar rites are recommended on dvadashi tithi (the twelfth day of the lunar fortnight), during shuklapaksha and in the months of Pousha and Falguna. In fact, such rites can be oberved in all the months, on ekadashi tithi and dvadashi tithi. The observance of these vratas brings punya that is far in excess of any punya that can be obtained from the performance of famous yajnas. There is another vrata which brahmanas, kshatriyas, vaishyas, shudras and even women can observe. This is known a pournamasi vrata as it is performed on the day of the full moon (purnima). It can be observed in any month. Observance means praying to Vishnu and Lakshmi with a pure heart. Mantras should be chanted and the Puranas should be recited. Rice, sesamum seeds and clarified butter have to be offered to the fire. After these are over brahmanas have to be invited and fed. It is best if the rite is observed in all the months and the vrata comes to a close in the month of Kartika. That is an auspicious occasion for building a temple dedicated to Vishnu. Narayana is another name for Vishnu. Since one prays to Vishnu and Laksmi, this vrata is also known as lakshminarayana vrata. A vrata named dhvajarohana is recommended for everyone, irrespective of whether he is man or woman and irrespective of what class he belongs to. A dhvaja is a flag and a flag is erected atop Vishnu’s temple in the course of this vrata. This begun on ekadashi tithi, during shuklapaksha and in the month of Kartika. Vishnu has to be worshipped first and four brahmanas have to be invited to act as priests. The sun, the moon and Garuda also have to be worshipped. Amongst the prescribed offerings are turmeric, long-rained rice and fragrant flowers. Besides this, one hundred and eight bowls of rice pudding and clarifed butter have to be offered to the fire. The flag can be erected either on the top of the temple or on the main gate. As long as the flag waves in the wind, the sins of the person who has erected the flag are forgiven. Many years ago, in satya yuga, there used to be a king named Sumati. He was born in the lunar dynasty. The king was handsome and righteous and he ruled over the seven regions of the worlds. Sumati never lied and he was so hspitable that he never refused even a dog as a guest. Sumati was devoted to Vishnu and so was his wife Satyamati. The king and his wife were also jatismaras, that is, they could remember the incidents of their earlier lives. Sumati and Satyamati fed the poor, they dug poinds and faithfully observed the dhvajarohana vrata. On such occasions, satyamati used to dance in Vishnu’s temple. There was a sage named Vibhandaka. He and his disciples once came to visit this holy couple. The king and the queen were delighted and welcomed the sage with offerings. "We are gratified that you have come to visit us," they said. "Please tell us what can we do for you?" Vibhandaka blessed them and replied, "Truly well spoken. Not only are you holy, but you are modest as well. Modestly is the root of all virtues. I am very happy to have met you. There is nothing that you can do for me, except provide the answers to two questions. Why do you faithfully observe the dhvajarohana vrata and why does Satyamati dance in Vishnu’s temple?" Sumati recounted their past histories for the sage’s benefit. In an ealier life, Sumati used to be a shudra named Matuli who was evil. Matuli would harm other people and steal offerings that were meant for the gods. Since he was a sinner, he was poor and lost all his sons. His friends also deserted him. Matuli thereupon retire dto the forest and survived on deer meat. On one particular occasion, Matuli was very hungry and thirsty and came upon a pond that stood in the middle of the forest. There was a temple of Vishnu by the side of the pond and swans and geese sported ont he water. Mantuli satisfied his hunger with lotus stalks and also quenched his thrist. He began to live in that dilapidated temple and repaired parts of it. He built a house for himself near the temple and adopted the profession of a hunter. There was a woman named Kokilini who had been born as the daughter of a hunter. Kokilini was forsaken by her friends and relatives and arrived at the forest, suffering from hunger and thirst. Matuli offered her fruit and meat and water. He discovered that Kokilini hailed from the region known as the Vindhyas. She was the daughter of a hunter named Damhbika and had done all sorts of evil things in her life. But once her husband had died, her friends and relatives had forsaken her and she had nowhere to go to. Matuli married Kokilini. They lived there and often got drunk on wine. In these drunken sprees, they were in the habit of dancing in the temple. During one of these bouts, they happened to die and Yama’s servants arrived to take Matuli and Kokilini to hell. But Vishnu had been pleased by the dancing. Vishnu’s servants also arrived and would not permit Matuli and Kokilini to be taken to naraka. They maintained that these two were the beloved of Vishnu, and hence, all their sins had been forgiven. Kokilini had pleased Vishnu with her dances. As for Matuli, he had erected a flag on the temple in the course of the reapir work that he had done. This amounted to an observance of dhvajarohana vrata. The two groups of servants took matuli and Kokilini to Vishnuloka, the abode of Vishnu. After enjoying themselves there for thousands of years, Matuli and Kokilini had been born as Sumati and Satyamati. They were born as jatismaras and remembered all that had earlier transpired. Sumati therefore continued to observe the dhvajarohana’vrata and Satyamati continued to dance in Vishnu’s temple. There is a vrata named haripanchaka. This is observed on dvadashi tithi during shuklapaksha and in the month of Margashirasha. Vishnu’s image has to be bathed and offerings of incense, flowers and betel leaves have to be made. For four successive days one prays to Vishnu, starting from the twelfth day of the lunar fortnight to the day of the full moon. Thereafter, brahmanas have to be invited and fed. The rite is observed every month starting from Pousha and ending with Kartika. The punya acquired from observing this vrata is equivalent to the punya obtained from donating millions of cows. There is another vrata that is observed on dashami tithi (the tenth day of the lunar fortnight), during shuklapaksha and in the months of Ashada, Shravana, Bhadra and Ashvina. 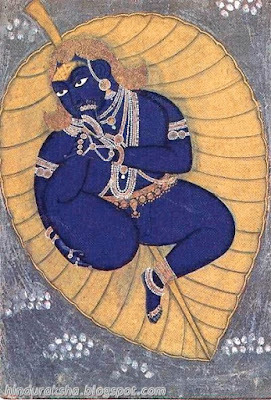 This vrata is superior to performing many yajnas. There was a sage named Galava who lived on the banks of the Narmada river. Galava’s son was named Bhadrashila and he happened to be a jatismara. Bhadrashila was devoted to Vishnu. Even as a child, he had been in the habit of making temples to Vishnu out of clay and worshiping Vishnu. He would tell everyone about the virtues of observing a vrata on ekadashi tithi (the eleventh day of the lunar fortnight). Galava was indeed very happy that his son was so devout. But he was also slightly mystified. He told Bhadrashila, "I am fortunate that I have such a devout son. Your character is beyond reproach and you are devoted to Vishnu You faithfully observe all the vratas. How did you come to acquired these traits?" "That is because I remember the experiences of my earlier lives," replied Bhadrashila. "I am a jatismara. I remember what Yama had told me." Bhadrashila used to be a king named Dharmakirti, born in the lunar dynasty. His guru was the sage Dattatreya. For nine thousand years Dharmakirti ruled the earth, performing good deeds as well as evil ones. But towards the end, he was drawn to evil and committed only sins. He associated with evil persons and his store of accumulatd punya was gradually depleted. Dharmakirti gave up the performance of yajnas; he deviated from the path prescribed by the Vedas. Taking a cue from their king, his subjects also became evil. A king is entitiled to one-sixth of his subjects’ earnings. Thus, Dharmakirti was also credited with one-sixth of the sins that his subjects committed. One day, the king went on a hunt to the forest, he killed many deer and became hungry and thirsty. The river Reva flowed through the forest and Dharmakirti bathed in the river. But there was no food to be had. Meanwhile, some pilgrims also arrived there and these pilgrims were observing a vrata on ekadashi tithi. The rites involved fasting and staying awake at night. Together with the pilgrims, Dharmakirti also fasted and stayed awake at night. But the king was virtually starving from lack of food. When morning dawned, he died of starvation. Yama’s servants arrived to take Dharmakirti to Yama. Their visages were terrible. The trip to Yama’s abode took many days, but eventually Dharmakriti arrived there and was taken before Yama. Chirtragupta keeps account of all good deeds and sins. Yama called Chitragupta to him and said, "Dharmakirti has been brought here. Tell me about the punya that he has accumulated and the sins (papa) that he has committed." "This man has been really evil," replied Chitragupta, "However, he has happened to fast on ekadashi tithi. His sins have, therefore, all been forgiven." Yama summoned his servants and started to soundly berate them. "What have you done?" he demanded "How dare you bring such a holy person to me? You have been told that you should not bring for punishment people who observe ekadashi vrata. Nor should you bring those who pray to Vishnu. Such people go straight to heaven. Bring only sinners here." Yama repeated to Dharmakirti what he had told this servants and the king became penitent for his past misdeeds. He had however accumulated a lot of punya because of observing ekadashi vrata. He therefore spent a lot of time in heaven, before being born again as a brahmana. It is because he remembered all these incidents that Bhadrashila was so devout. He ralized that if there was so much of punya to be obtained from unconsciously observing ekadashi vrata, great indeed must be the punya that could be attained from observing the rite consciously. Galava regarded himself as exceedingly fortunate to have fathered such a wonderful son. There are four classes (varna) and these are brahmanas, kshatriyas, vaishyas and shudras. The brahmanas class is superior to the other three. Brahmanas, kshatriyas and vaishyas are sometimes also referred to as dviya or trija. The word dvija signifies a person who is born twice and the word trija is used for a person who is born thrice. When the word dvija is used, one refers to two births that these three classes go through. The first is the act of physical birth and the second is the sacred-thread ceremony (upanayana). When the word trija is used, a third birth is included. This the act of initiation (diksha). Shudras do not have upanayana or diksha. Dharma means that each class must perform the duties that are prescribed for it. Any deviation from this principle leads to adharma (sin). The primary duties of a brahmana are donating alms, performing yajnas, worshipping the gods and reciting the Vedas. He should also be devoted to Vishnu and should never use harsh words. And he should regard other people’s property as being as worthless as stones. The primary duties of a kshatriya are donating alms to brahmanas, reciting the Vedas and performing yajnas. A kshatriya also has to take up arms and protect the world. He is entrusted with the responsibility of punishing the evil and protecting the good. A vaishya must study the Vedas. That apart, the duties of a vaishya are animal husbandry, agriculture and trade. The shudras are permitted to donate alms, but their primary duty is to serve the other three classes. All four classes should be pleasant of speech and should try to do good to others. No individual should be overly addicted to sloth or to sensual pleasures. In times of danger or calamity, it is permitted that a brahmana take up the occupation of a kshatriya or a vaishya. Similarly, it is permitted that a kshatriya take up the occupation of a vaishya. But under no circumstances should an individual belonging to one of the first three classes take up the occupation of a shudra. A person who does this is to be regarded as a chandala (outcast). When a son is born, a father has to perform a ceremony named nandimukha. It is only after this that the boy can be named. A brahmana should have his upanayana ceremony when he is eight years of age, a kshatriya when he is eleven and a vaishya when he is twelve. A brahmana ties his sacred thread around his waist, a kshatriya uses the string of his bow for the same purpose, and a vaishya uses sheepskin. Brahmanas can wear the skins of black buck, kshatriyas are meant to wear the skin of a deer named ruru, and goatskin is indicated for vaishyas. If a brahmana carries a stick, it can be so long that it extends upto his hair. But a kshatriya’s stick should not extend beyond is forehead and a vaishya’s beyond his nose. There are four ashramas (stages of life). The first is called brahmacharya (stage of celibate studenthood). During this period, an individual studies the Vedas in his guru’s house and serves his guru well. He lives only on food that he has obtained through begging. There are some objects that are forbidden for such an individual. He is not permitted to eat honey, meat, salt and betel leaf. Nor is he allowed to sleep during the day, wear garlands or slippers or use an umbrella. He has to stay away from gambling, singing and dancing. When he has studied the Vedas well, the student is ready to step into the next stage of life. But prior to that, he has to pay a fee (dakshina) to his teacher. The second ashrama is garhasthya (householder stage). The individual has to get married before he can enter the second stage of life. The bride and the groom should not be related to one another, upto seven generations on the father’s side and upto five generations on the mother’s side. Cleaniness brings great punya to a householder. He also has to serve his guests well. A guest who goes away dissatisfied leaves his papa with the householder and takes the householder’s punya away. The third ashrama is vanaprastha (forest-dwelling stage). A householder embarks on this when he discovers that his hair is turning grey and his skin is getting wrinkled. He leaves his wife with his grown-up sons or takes her with him and retires to the forest. He is no longer permitted to clip his nails or shave his hair and he has to sleep on the ground. For food, he is allowed fruit and roots. Under no circumstances should he eat at night. His entire time is taken up with meditating on Vishnu. The fourth and final ashrama is sannyasa (hermit stage). This should only be embarked upon when one’s mind is completely detached from the world. It is pointless to become a hermit if one is still addicted to material pursuits. A hermit should completely shave off his head. He has no friends and no enemies. Insults or praise mean nothing to him. He obtains his food by begging for alms. A hermit should not spend more than one night at a stretch in a village or more than three nights at a stretch in a city. The Narada Purana next describes funeral (shraddha) ceremonies. Any religious rite that involves fasting should be done on one of the following tithis (lunar day) - dvitiya (second), shashthi (sixth), ashtami (eighth), ekadashi (eleventh), chaturdashi (fourteenth), amavasya (night of the new moon) and purnima (night of the full moon). Vratas are recommended in shuklapaksha, not in krishnapaksha. If there is a solar or a lunar eclipse, one should not eat until the sun or the moon has been seen again. Nor should one eat for four hours before a solar eclipse and for three hours before a lunar eclipse. "But," said the sages, "What happenes if one commits a sin? What form does the penance (prayashcitta) take?" The severest sin is that of killing a brahmana. This may happen inadvertently. In such cases, the murderer must place his hand on the dead man’s forehead and beg forgiveness. He then retires to the forest. He keeps matted hair and eat only once a day, that too, only fruit and roots. He meditates only on Vishnu. The sinner also visits various famous places of pilgrimage. But he makes it a point to tell whomsover he meets that he has committed the sin of killing a brahmana. The period of penance continues for twelve years, after which the sin is pardoned. There might occur situations where the sinner dies before the twelve years are over. If the sinner is killed by a deer or if he dies of disease, the sin is automatically forgiven. It is also pardoned if the person concerned dies while saving a cow or brahmana. The penance for killing a kshatriya is the same as that for killing a brahmana. Alternatively, the murderer may immolate himself in a fire or kill himself by jumping off a high place. But generally speaking, the sin of killing a kshatriya is only half as severe as that of killing a brahmana. And the sin of killing a vaishya is only one-third as severe as that of killing a brahmana. A shudra who kills a brahmana is to be beaten to death with a club. There are three types of wine, known as goudi, madhvi and paishti. The drinking of wine is forbidden. If one drinks wine, the prescribed penance is the drinking of clairfied butter and the urine of cows. Drinking wine, in fact, is as great a sin as the killing of a brahmana. There are various units for measuring gold (kanchana). When sunlight filters through a window, small particles can be seen. These are known as trasarenu. Eight trasarenus make a nishka, three nishkas are one rajasarshapa, three rajasarshapas are one gosarshapa, six gosarshapas are one yava, three yavas one krishnala, five krishnalas one masha and sixteen mashas one suvarna. A person who steals gold amounting to one suvarna from a brahmana commits a sin tha tis equivalent to the killing of a brahmana. The same sort of atonement is thus indicated. In addition, the sinner has to apply clarified butter and cowdung on his body. If a kshatriya steals gold from a brahmana, he has to perform a horse sacrifice. The alternative is to donate to brahmanas three hundred cows or gold equivalent to the weight of one’s own body. But if the thief shows penitence and returnes the gold to the brahmana immediately after he has stolen it, twelve days of fasting is enough. The penance is halved if the object that has been stolen is not gold, but is gem, land or cattle. a sound, syllable, word, or group of words that manifest spiritual power when chanted'); return false" style="color: rgb(0, 91, 128); text-decoration: none; border-bottom-width: 1px; border-bottom-style: dotted; border-bottom-color: initial; cursor: help; ">mantra (an incantation) one thousand and eight times. If the amount of stolen gold increases to one yava, the mantra has to be chanted throughout an entire day. For stealing gold amounting to one krishnala, a special vrata named santapana has to be observed. What about situations where one masha of gold has been stolen? Then the sinner has to eat for three months foodgrains soaked in the urine of cows and worship the gods for a corresponding period. The period is increased to one year if the amount of stolen gold is more than one masha, but less than one suvama. Separate vratas are prescribed for the stealing of silver, bronze, brass, copper and jewels. The severity of the vrata depends on the object that has been stolen and on the amount of the theft. A person who associates with a sinner has to undergo penance. The penance is the same as would have been the case had he committed the sin himself. There is a special vrata known as prajapatya. A person who kills a mongoose, crow, boar, rat, cat, goat, sheep, dog or a hen, has to observe half a prajapatya vrata. A person who kills a horse has to observe three such rites. Other rites are prescribed for those who kill elephants or kill cows inadvertently. If a cow is consciously killed, no penance other than death will suffice. A person who steals wood, grass, trees, molasses, meat or skins will fast for three days. A person who kills birds, turtles or porpoises will fast for twelve days. Yajnas and religious rites are sacred ceremonies. If the voice of a chandala is heard while such rites are going on, it is recommended that one fasts for a day and purifies oneself by partaking of clarifed butter on the second day. One thousand and eight gayatri mantras also have to be chanted. No penance is prescribed for those who criticize the gods or the brahmanas. Such sinners are beyond redemption. No penance is successful unless it is accompanied by faith in Vishnu. The sins are forgiven even if one prays to Vishnu inadvertently. Praying to Vishnu is far superior to visiting places of pilgrimage or performing religious rites. Yama’s abode is very far away. Those who have accumulated punya have nothing to fear there. But the sinners have every reason to be scared. The righteous enjoy the trip to Yama’s abode, but the sinners suffer a lot. The sinners suffer from hunger and thrist and weep throughout the journey. Yama’s servants continually beat them with whips and weapons. The road is lined with mud, fire and hot sands. Hail, burning ? , stones and weapons shower down. In some places there are blistering winds. Parts of the road are dark and bristle with sharp thorns. One has to climb mountains and creep through caves. The sinners accordingly suffer throughout the journey. Yama’s servants goad and prod them along, pulling them with nooses tied around their necks. Weights are attached to the bodies of the sinners so a sto make the journey even more difficult. Blinders are sometimes put on the eyes so that the sinners can’t see. They fall into pits and holes. It is during this journey that sinners become penitent for their past misdeeds. But by then it is too late. The righteous have no cause to fear the journey. They travel in great comfort. Those who have donated food get delicious meals along the way. Those who have donated water slake their thirst with condensed milk. Thse who have donated clothes get wonderful clothes to wear. Those who have donated land or houses do not have to walk at all. They travel in vimanas (space vehicles) and are served by apsaras (dancers of heaven). This is also true of those who have donated horses, chariots or foodgrains. Upon reaching Yama’s abode, people are taken before Yama. Yama has four hands and in three of these hands he holds a shankha (conch shell), a chakra (bladed discus) and a gada (mace). The righteous are welcomed by Yama and sent off to enjoy the fruits of their punya. But the sinners tremble before yama’s stern visage. He treatens them with his sceptre (kaladanda). His voice thunders. The righteous get to see Yama’s pleasant appearance, while his terrible appearance is reserved for the sinners. This terrible manifestation has twenty-two arms, bloodshot eyes and fearsome teeth. Chitragupta is Yama’s companion and keeps account of all good deeds and sins. He tells the sinners, "You are evil, you have many sins to your credit. Suffer in hell, repentance now will serve no purpose." The sinners are then taken to hell (naraka). After they have served their sentences in hell, they are born again. They are first born as trees, herbs, grass and creepers. They are thereafter born as worms. When these lives are over, they are born as animals. It is only after several lives that they get to be born as humans again. But ther are different gradations in the human lives as well. The sinners progressively graduate from being born as tanners to being born as outcasts, hunters, washermen, potters, blacksmiths, goldsmiths, weavers and traders. Some are born rich, others are born poor. Some are born hale, others are born diseased and malformed. Each birth is determined by the actions of one’s earlier lives. The world is full of miseries. How does one rise above the illusions of the world, how does one free oneself from these miseries? How does one attain bliss(moksha)? It is Vishnu who provides bliss, Brahma creates the world on Vishnu’s orders and Shiva destroys it also on Vishnu’s instructions. The entire universe is completely identified with Vishnu. Vishnu has no form, nor is he without form. He is the source of all dharma. It is from him that all the elements originate. Humans who worship him become like gods. True knowledge consists of the realization that Vishnu is everything. In this sense, bliss can be achieved through knowledge (jnana). Knowledge needs the bedrock of faith (bhakti) to support it. Good actions (karma) give rise to faith in Vishnu. In fact, actions are the first step towards attaining knowledge. There are very few people who can embark on the path of knowledge straight away. In the final stage of knowledge, one realizes that Vishnu is everywhere in the universe and that there is therefore no difference between oneself and other living beings. This sense of union with Vishnu is referred to as yoga. A person who is for this sort of supreme knowledge is known as a mumukshu. There are certain traits that enable one to identify a mumukshu. He has no sense of anger or hate, he is not addicted to the senses and he evinces pity towards all living beings. His mind is perpetually preoccupied with thoughts of Vishnu. The path of yoga is aided by eight techniques. The first of these is known as yama (self-control). This requires non-violence, truthfulness, love, pity and control over the senses. Jealousy and envy also have to be given up. The second technique is niyama (practice). This requires meditation, chanting incantations, reading sacred texts and cleanliness. Yama and niyama purify the mind and the body and thus enable one to meditate on the true nature of Vishnu. But meditation requires a proper posture and this the third technique of asana (posture). There are thirty major postures that are recommended for someone who is practising yoga. The fourth technique is pranayama (controlling one’s breath). The control over one’s breath aids the process of meditation. The fifth technique is known as pratyahara (withdrawal). This means the withdrawal of the mind from all sorts of sensual pleasures. The sixth technique is known as dharana (retention). One visualises the identity of the paramatman and the jivatman, and retains the image of the identity in one’s mind. It helps to concentrate one’s mind on an image of Vishnu seated on a lotus flower. When one meditates continuosly on this image, that constitutes the seventh technique of dhyana (contemplation). There are three objects that are involved in the process of meditation¾ the person who is doing the meditating, the object of meditation and the act of meditation. When all sense of distinction between these three objects is lost, the contemplation can be regarded as complete. When the final point of contemplation is reached, one attains the eighth and final technique of samadhi (intense bliss). The brahman is fixed in the mind of such a person and he loses all other senses. A person who is devoted to Vishnu is eternally blessed. Many years ago, a brahmana named Devamali lived in the land of Raivata. He was learned in the Vedas, pitiful towards other living beings, and devoted to Vishnu. But unfortunately, he had many sons, friends and a wife to take care of. Making a living was difficult and Devamali was constrained to trade in objects that no brahmana should touch. He also interacted with outcasts. He thus committed many sins. After some years, two sons named Yajnamali and Sumali were born to Devamali. With great care and perseverance, the father taught the sons how to make money. By then, Devamali himself had made a lot of money and had accumulated a lot wealth. One day, he sat down to count his wealth and discovered that he had millions and millions of coins. He thought to himself, "I had made a lot of money; look at the number of coins I have accumulatd. Unfortunately, I have had to do this through evil means, by means of trading in objects that I should not even have touched. But is it not strange that, despite all my riches, my thirst for more wealth remains unsatiated? This conclusively proves that it is the craving for riches that is the root of all evil. One continues to want more wealth even if one’s teeth decay and one’s skin gets wrinkled. A person who wants peace should give up all hankering after riches. I think tha tI have had enough. I should now start to think about the life that comes hereafter." Thinking this, Devamali resolved that he would devote himself to the path of dharma. He divided his riches into four parts. He retained two parts for himself and distributed the remaining two parts to his sons Yajnamali and Sumali. With a view to acquiring punya, Devamali constructed temples and gardens and had ponds constructed. He went to the banks of the Ganga and donated alms. In this fashion, he exhauted all his wealth. Eventually, he went off to perform tapasya in the forest known as vadrikashrama. In the hermitage there lived many sages. Devamali joined them in their meditations. He contemplated on the true nature of the brahman. The sages gave Devamali plenty of good advice. One particular sage named Jananti taught Devamali the techniques of yoga. It was through the practice of yoga that Devamali was freed of all his illusions. You will remember that Devamali had two sons named Yajnamali and Sumali. Yajnamali was the elder of the two. Yajnamali divided whatever riches he had received from his father into two parts and gave one part to Sumali. But Sumali spent all his wealth on idle and evil pursuits. When his money was exhausted, he resorted to theft and robbery. Yajnamali tried to restrain his brother. "Please mend your ways," he told Sumali. "What you are doing is evil. Do not bring ill repute to our family." These words of advice only served to anger Sumali and he took up a sword to kill his borther. But the city-guards came and arrested Sumali before he could cause his brother any harm. Yajnamali used his good offices to free Sumali. He divided whatever riches he then possessed into two parts and gave one part to Sumali. As had happened earlier, Sumali again spent this money on evil and idle pursuits. Sumali’s friends and associates were evil and outcasts. He was punished by the king and banished to the forest. When this happened, all his co-called friends deserted him. Yajnamali was righteous. He associated with holy people, donated alms and dug ponds. Soon his wealth was also exhausted, being spent on all these good pursuits. Yajnamali retired to a temple of Vishnu and there spent his time in worshipping Vishnu. By a curious quirk of fate, Yajnamali and Sumali died at the same time. A vimana arrived to take Yajnamali to heaven. While travelling in this wonderful vehicle, Yajnamali noticed that his brother was being taken to hell. Yama’s servants were beating Sumali and the poor fellow was suffering from hunger and thirst. Yajnamali asked Vishnu’s companions, who had come to take him up to heaven, "How can my brother be freed of his sins?" "Let us tell you your story," replied the Companions. "In your earlier life you were born as a vaishya named Vishvambhara. You were evil and committed many sins. You were so evil that you deserted your parents and all your firends, in turn, deserted you. Once you were hungry and thirsty and sought refuge in a temple of Vishnu. Your feet were dirty and when you tried to clean them, part of the temple also got cleaned. This was a punya that was credited to your account. Since you had no food, you fasted throughout the night. And in the morning you died of snake-bite. But the little bit of punya was enough to ensure that you became devoted to Vishnu in your next life, when you were born as Yajnamali. So far as your brother is concerned, there is indeed a way to free him. Give him the punya that you had acquired as a result of cleaning part of the temple and your brother shall go free." Yajnamali did as he had been bidden. Yama’s servants immediately left Sumali and fled. A wonderful vimana came down to take Sumali as well to heaven. The two brothers were delighted to see each other. So great was Yajnamali’s punya that he did not have to be born again. But after spending some time in heaven. Sumali had to be born again. In his next life, he was devoted to Vishnu and performed only good deeds. Eventually, he too was freed. Such is the wonderful punya that can be acquired from something so trivial as cleaning a tiny part of Vishnu’s temple. A house where Vishnu is not worshipped is like a cremation ground and a person who does not pray to Vishnu is like a dead body. Humans who do not worship Vishnu and do not revere the Vedas, brahmanas and cows are like rakshasa (demons). But devotion to Vishnu does not come automatically. It itself is earned through the punya of many lives. Even a little bit of devotion to Vishnu destroys the accumulated sins of many lives. This is irrespective of whether this devotion is conscious or not. Inadvertent prayers to Vishnu also confer on one the right to live in heaven. In satya yuga there lived a hunter named Kanika. He was a robber and stole other people’s property. He oppressed others and killed hundreds of cows and brahmanas. He even stole objects from temples. So myriad were his sins that it would take millions of years to catalogue them all. One day, the hunter went to the city of Soubira. There was a temple to Vishnu there and a number of golden pots adorned the top of the temple. Kanika was delighted to see these golden pots. He thought that he would be able to steal a lot of gold. Accordingly, he entered the premises of the temple at night. A sage named Utanaka was sleeping in the courtyard of the temple. Kanika decided that the sage was an obstacle to his stealing the golden pots. He therefore placed his feet on the sage’s chest and prepared to behead him with a sword. Utanka woke up. "Why are you trying to kill me?" he asked. "I have done you no harm. People only kill those who have done them some harm. It is a sin to punish those who have not committed any transgression. One might commit sins to feed one’s near and dear relatives. But the sins do not accrue to the accounts of the relatives; they are one’s own. Relatives are meaningless; they do not last beyond the earthly life. It is only the papa and the punya that are carried over beyond death." These words struck terror in Kanika’s heart. He begged forgiveness from the sage and became penitent. "It is my great good fortune that I have met you," he told the sage. "I am a sinner. What can I do to free myself? Where shall I seek refuge? To whom shall I pray? I must have committed many sins in my ealier life to have been born as a hunter in this life. But woe and alas, I have committed sins in this life as well. What is to become of me? For how many lives more must I suffer?" So great was Kanika’s shame and mortification that he died on the spot. Taking pity on the poor hunter, the sage sprinkled some holy water on the dead body. The water was holy because it had been used to wash the feet of one of Vishnu’s images. Wonder of wonders - as soon as the sanctified water was sprinkled on the dead body, all of Kanika’s sins were forgiven. A vimana descended to take him up to heaven. Utanka ws thunderstuck to see this wonderful happening. He started to pray to Vishnu. And Vishnu appeared before the sage and granted him the boon that he would be rendered free of all wordly bonds. Many years ago, there used to be a king named Yajnadhvaja. He was born in the lunar dynasty. The king was devoted to Vishnu. He got all of Vishnu’s temples cleaned regularly. He made sure that lamps were lit in the temples at night. Yajnadhvaja also had a temple to Vishu built on the banks of the river Reva. There too, he made arrangements for the temple to be swept regularly. And he also made sure that lamps wre lit in the temple at night. The king had a priest named Vitahotra. Vitahotra once asked the king. "Please tell me what is so special about cleaning temples and lighting lamps in them at night. There are many other tasks that are regarded as being sacred to Vishu. Why do you devotee special attention to these two tasks?" "Let me tell you my story," replied Yajnadhvaja. The king remembered the story because he was a jatismara. Many years ago, in satya yuga, there was a brahmana named Raivata. The brahmana had studied the shastras well. Nevertheless, he acted as priest for people whom no brahmana should serve as priest. Raivata was also cruel and he traded in goods that no brahmana should touch. Because of these evil ways, the brahmana’s friends and relatives deserted him. Raivata had no opiton but to wander around from country to country. In a poor and diseased state, he finally died on the banks of the river Narmada. Raivata’s wife was named Bandhumati. She too was evil and gave birth to a son named Dandaketu. This turned out to be a sinner. He oppressed brahmanas, stole other people’s property, drank wine and killed many living beings. One night, Dandaketu happened to turn up at a temple of Vishu. He decided to spend the night there. To clean a place for him to sleep at night, Dandaketu swept part of the temple with his clothing. Although he did not realize it then, this act of piety pardoned many of his sins and gave hima lot of punya. The sinner then lit a lamp so that he could see better. And this additional act of piety pardoned all his ealier sins. Meanwhile, the city-guards arrived at the temple. They took Dandaketu to be a thief and killed him. But since Dandaketu had now acquired such a lot of punya, a vimana descended and took him straight up to heaven. After spending some time there, he was born again as the king Yajnadhvaja. Yajnadhvaja told Vitahotra, "Now yu realize the increditble amount of punya that I accumulated by sweepinga temple and lighting a lamp, there inadvertently. Can you imagine what the punya would be like if I did these things consciously? Thankfully, I am a jatismara and I remember the events tha ttranspired in my earlier life. No wonder then that I devote so much of attention to the cleaning of temples and to the lighting of lamps there. I am sure that your question is now answered. Vitahotra marvelled at the story and became even more devoted to Vishnu. If one wants to overcome the miseries of life, one has to pray to Vishnu. There is no other way. Great punya is also acquired by serving those who are devoted to Vishnu. If a person serves Vishnu’s devotees, twenty-one of his ancestral generations ascend to heaven. All the gods and Lakshmi, the goddess of wealth, are ever-present in a house where Vishnu is worshipped. A house where the basil tree, sacred to Vishnu, is planted, is eternally blessed. Also blessed is a house where there is a shalagrama, Vishnu’s image. Once, Indra went to Brishaspati, the teacher of the gods, and asked, "I have heard that the gods change from manvantara (era) to manvantara. Can you please tell me the names of the gods who have ruled earlier?" "I am not that old," replied Brihaspati. "I do not know the answer to your question. But there is a holy man named Sudharma. He knows everything and is bound to know the answer to your question. Let us go up to him and ask." Accompanied by the other gods, Indra and Brihaspati went to visit Sudharma. After they had worshipped the learned man, Indra asked, "Tell me, what is the secret of your knowledge? Have you donated a lot of alms or performing many yajnas? Or does the secret lie in visiting tirthas and peforming tapasya? Please also tell us about the various manvantaras." "I will first tell you about the manvantaras," replied Sudharma. There are fourteen such eras in one of Brahma’s days. Each such era is ruled over by a Manu. And the gods also change from one manvantara to another. In addition, the title of Indra changes hands. The second Manu was Svarochisha. The gods were the paravatas and tushitas and the Indra was Vipashchita. The third Manu was Uttama. The gods were the sudhamas, satyas, shivas and pratardanas and the Indra was Sushanti. The fourth Manu was Tamasa. The gods were the surupas, haris, suptas and sudhis and the Indra was Shibi. The sixth Manu was Chakshusha. The gods were the adyas and the Indra was Manojava. The seventh manu was Vaivasvata. This is the manvantara that is now current. The gods are the adityas, vasus and rudras and the Indra is Purandara. There will be seven more manvantaras before the destruction. The eighth Manu will Suryasavarni. The gods will be the sutapas and the Indra will be Vali. The ninth manu will be Dakshasavarni. The gods will be the paravatas and the Indra will be Adbhuta. The tenth manu will be Brahmasavarni. The gods will be the vamanas and the Indra will be Shanti. The eleventh Manu will be Dharmasavarni. The gods will be the vihangamas and the Indra will be Vrisha. The twelfth manu will be Rudrasavarni. The gods will be the haritas and the Indra will be Ritadhama. The thirteenth Manu will be Rouchya. The gods will be the sutramas and the Indra will be Divaspati. The fourteenth Manu will be Bhoutya. The gods will be the chakshushas and the Indra will be Shuchi. "You also asked about the source of my punya," continued Sudharma. "I used to be a vulture and lived on carrion. Once I was sitting on a wall that surrounded a temple of Vishnu. Suddenly a hunter arrived and shot me dead with his arrow. My dead body fell down on the ground and a dog picked it up in the mouth. Pursued by other dogs, the dog circled the temple. This act of piety freed me and the dog of all illusions and gave us a lot of punya. It is my secret." Indra wondered at this story and himself became a devotee of Vishnu. "You have answered all our questions," the sages told Suta. "We are much obliged. There remains one final question. Please tell us about the four yugas and their characteristics." There are four yugas (eras). They are known as satya yuga or krita yuga, treta yuga, dvapara yuga and kali yuga. Four such yugas constitute a mahayuga and a mahayuga lasts for twelve thousand years of the gods. In satya yuga dharma reigns supreme and everyone is as righteous as the gods. Each varna pursues the duties that are prescribed for it and people are devoted to Vishnu and to tapasya. The law of the four ashramas is meticulously followed and the Vedas are studied. In treta yuga the miseries of people increase, although the dictates of dharma continue to be followed. In dvapara yuga the power of dharma diminishes and the Vedas have to be divided to disseminate the knowledge among humans. People start to lie and anger and hate start to become common. If yajnas are performed, they are always with some end in view, not because of selfless and altruistic reasons. Life expectancies start to diminsh. Kali yuga is the worst of the four eras. It is extemely rare to find a righteous person. Yajnas also become rare. Jealousy, vanity and hatred are however very common. People do not live for very long. Even the brahmanas stop studying the Vedas. The kings who rule then are bad kings; they are obsessed with the idea of accumulating wealth. In fact, the word king conveys no meaning at all. Anyone who has many chariots, horses or elephants comes to be called a king. The brahmanas become the slaves of the shudras. The brahmans strive after evil pursuits and forever try to acquire the possessions of others. Sons hate their fathers, students their teachers, and wives their husbands. People eat fish and meat. They even plough the banks of rivers to grow foodgrains. If cows are taken care of, that is only because they provide milk. No one likes a person who is devoted to Vishnu. Towards the end of kali yuga, no one even remembers the name of Vishnu. But because evil reigns supreme in kali yuga, a minor good act in kali yuga gives a lot of punya. The punya that takes ten years to be acquire din satya yuga can be acquired in one year in treta yuga, one month in dvapara yuga and one day in kali yuga. The punya that required meditation and sacrifices in the other three eras can be acquired through just chanting the name of Vishnu in kali yuga. Vishnu is the salvation for everyone in kali yuga. Suta told the sages, "I have now finished reciting to you the whole of the Narada Purana. This a sacred text. Someone who reads a single couplet from this Purana is forgiven all his sins. Someone who reads an entire chapter acquires the punya that can be otained from wonderful yajnas. If this text is kept inside a house, ghosts and demons avoid the house. Arson or theft are never heard of in the household. It is recommended that twenty shlokas from this Purana be read every morning." The Narada Purna ends rather abruptly. In the other Puranas, the sages generally thank Suta for his pains. There are no such couplets in this Puranan. The glories of the Purana are also described much more perfunctorily.